I love this time of year. I am usually a busy person, and like it that way, but for some reason at this point I am always ready to just slow down, have a pot of tea in the afternoon, watch a bit of TV during the day or just not worry about rushing about. During term time I feel like I am hardly at home in the daylight so it’s been lovely to sit in the dining room looking out at the garden, seeing all the birds and just letting my mind wander. I’d been given some lovely Christmas gifts from friends, including this cute “Married in 2018” mug (with penguin socks, because, penguins <3 ). 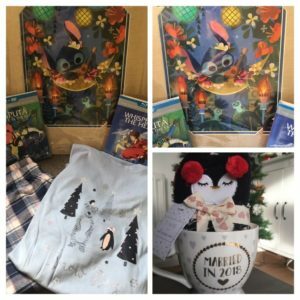 When we had been on holiday in Florida I’d seen this print of Stitch (Lilo and Stitch is one of my favourite films), so Andy had bought that for me, plus some penguin PJ’s and some Ghibli films to add to the collection. We unwrapped our presents on Wednesday evening while watching the Escape to the Chateau Christmas episode to add to the festive feelings. After getting back quite late on Wednesday evening, I pottered around at home for a bit before heading off on a run. To make the most of running in the light I headed down to the lakes. It was a really beautiful wintery day with lovely skies and clouds. It felt really early in the morning but I don’t think I left until about 9.30am! I did around 6.5 miles but had to take it slowly as one of my knees was feeling rather stiff- I had fallen asleep on the plane on the way home so I wonder if it was in an awkward position or something. 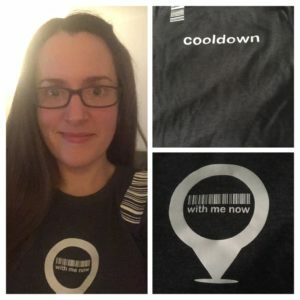 I was excited to find my With me Now t-shirt had arrived (team cool down for me)- it is super soft but I realised I should have got a long sleeved top as I only have a couple of long sleeved t-shirts (one of which is a Christmas themed one) and I like wearing them after a run. So now, do I order a long sleeved one too and then risk never wearing the short sleeved one? Andy’s parents were coming over in the evening so I did a bit of tidying and sorting (along to the Muppets Most Wanted soundtrack of course), before walking into town for an opticians appointment. Although my eyes were pretty much the same, it turned out I’d had my current ones for over 4 years now so a new pair was probably a good idea (I keep worrying I will drop them and I don’t have a spare pair as the ones I like are the ones with plastic frames and not included in the 2 for 1 deal). Anyway, they had a clever app which scanned your face and then worked out which glasses would suit you. I’d been browsing before my appointment but hadn’t seen any I liked, but in using the app (and explaining that I only like plastic frames as I don’t like the little things that rest on your nose, plus I don’t like thick arms as I don’t want to feel like I have blinkers on) the lady found 2 pairs straight away that were pretty much the same as my current ones but in slightly different colours. I was a bit sceptical but it was really useful. Andy’s parents came over after dinner to watch the football. They gave us a lovely bag filled with all sorts of treats including piccalilli (my favourite), pesto and crackers which will keep us going for a while. On Friday I went out on a long walk first thing, and then headed over to my parents to see family (my auntie and cousins were all going around there). It got a bit complicated because I had to leave in the afternoon to go and get my hair cut (I’d left it late to book and when I asked for an appointment she only had one left until March as she was going on holiday)-also Andy was working so when he finished my haircut was done and he picked me up on the way back to my parents. It was lovely to catch up with everyone and just a really relaxing afternoon/evening. Saturday morning was spent at a new parkrun (more on that another time) and then in the afternoon we parked outside of St Albans town and walked in. There were lots of postboxes with decorations on them raising money for some local charities so it was quite fun to spot some of them. We then popped in to give our niece and nephew their Christmas presents and then headed home. It was a bit warm for the fire so we put some candles in front of it instead- nearly as cosy! 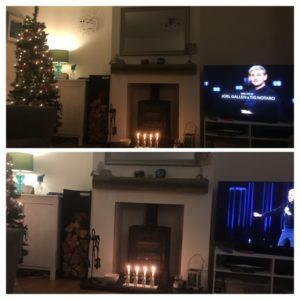 We watched one of the Ellen standups on Netflix which was very funny. This morning I had another enjoyable run to the lakes and back- I made it a little longer by adding on a small loop at the start so by the time I got home I’d run 8.5 miles. I realised I hadn’t run much further than a 10k for a long time now, and have the Brighton half at the end of Feb so needed to start getting my long runs a little longer. As I got home I had a text to say my glasses were ready so after a breakfast (porridge with meridian mince pie filling stirred in) we walked into town to pick them up. Then it’s been more pottering and the afternoon will probably involve a pot of tea and a little bit of TV. So our trip to Berlin wasn’t quite as planned, but we managed to fit a lot into the few days that we ended up with. 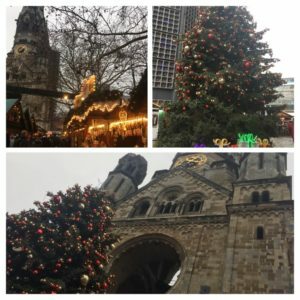 We flew out on Sunday in the end, and as we landed at lunch time we had time to check in to our hotel and then wander around a couple of Christmas markets close to our hotel. On the Monday (Christmas Eve) shops were open first thing, so we got a few picnic foods, but then everything seemed to close down (apart from the markets thankfully). 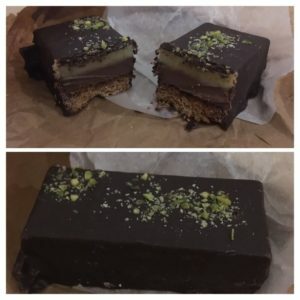 We had popped into a shopping centre to warm up (it was snowing at one point and so so cold) and Andy spotted a Mozart cake (Mozart seemed to love marzipan because all of the things named after him seem to have marzipan in them)- so we bought it to share later in the hotel. We also bought a stollen (with a gold seal on it) for my parents and some marzipan chocolates. There was a bit of a theme! Everywhere was beautifully decorated, and felt very festive. We walked a lot as although the trains and trams were running, it was nice to take our time and see the sights again. We walked to the Brandenburg gate (via a few markets), through the park to a couple more markets. 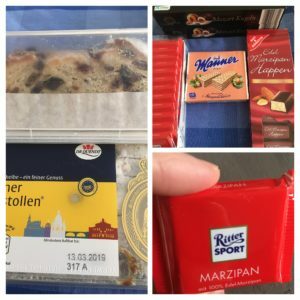 To continue the marzipan theme I found that a few of the markets did marzipan crepes- I’d had one in Cologne once and it was pretty amazing, so I may have had one one 3 out of the 4 days! 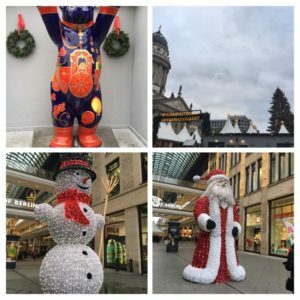 All the markets had the gingerbread stall, gluhwien stalls, bratwurst and so on, as well as some local things that we’d not seen anywhere else. Lots of places did these quarkballchen things which seemed to be a bit like doughnuts but I assume with quark in the dough (one place had a clear window so you could see the baker rolling the dough). After walking around all day on Christmas Eve and taking in several markets, we headed back to an evening of Christmas movies in the hotel room. To make up for not going to a German parkrun, I did my own run on Christmas day. 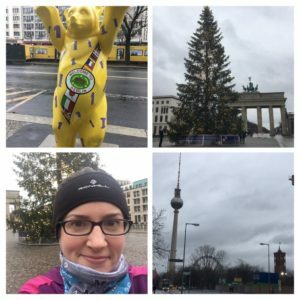 I could run from our hotel to the Brandenburg Gate and back again (out and back minimises the chance of me getting lost)- it was around 2 miles each way so a good start to the morning. Our hotel had breakfast which is always a nice treat- they even had little slices of stollen out with the ham (as you do). 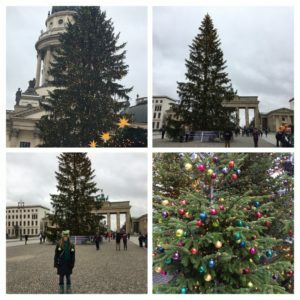 We did more walking on Christmas day (ending up at Checkpoint Charlie which was a bit surreal with the Christmas tree marking the spot where lots of people would have been shot for trying to cross the wall) and then got the train out to Charlottenburg Palace for the Christmas market there. It was so pretty and very busy, with lots of locals eating and drinking together. 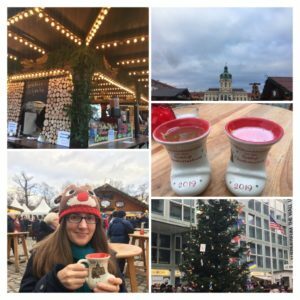 Andy was enjoying the Gluhwein, and lots of the places did variations on hot apple juice with spices, so I had one to warm up (I think it had bits of orange peel and ginger in it too). I bought a new decoration for our tree (a little moose one) so at least we didn’t spend all of our money on food! Side note- I have emailed both Bath and St Albans Christmas markets asking if they could consider using the cup deposit scheme that every single European market seems to have- you pay a few Euros for your cup, and then when you are finished you get the money back. I was shocked at Bath this year how overflowing the bins were, but it is no surprise when the stalls are not giving anyone the option of washable ones. After heading back to the hotel to warm up for a bit, we headed out as we were off to a concert at the concert hall. The Philharmonic Orchestra were playing music from movies, and it was just brilliant. I love seeing orchestras play as I just find it fascinating, and it was great to hear classics like Indiana Jones, Star Wars (they did a good few songs from Star Wars), ET, the music from the Great Movie Ride (Gone with the Wind), Game of Thrones (not strictly a movie but an impressive piece of music) and finishing with Soul Bossa Nova from Austin Powers. On Boxing Day we had the morning and early afternoon before we needed to get to the airport. It was drizzling so we got the train instead of walking, and ended up at another market. This one was by a huge church that had been badly damaged in the war, but they had decided to not repair it (but with a lot of preservation work). I think the last time we were in Berlin it must have been undergoing the renovations because the building was surrounded in perspex so it looked like a normal office building (there were photos of the work inside). It was an interesting place to visit. We also spotted a few of the brass plaques (stumbling stones) which show the last address of each victim of the holocaust- there is a little article here which explains them. My cousin had mentioned them to me before we went, and I think if I hadn’t looked out for them I would have seem them out of the corner of my eye and assumed they were the normal street furniture of water main hatches and so on. The rain got heavier so after a final market treat (marzipan crepe) we got our bags and headed to the bus for the airport. Time to put the new decorations on the tree and the treats in the cupboard! 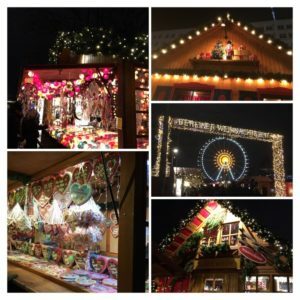 Do you like visiting Christmas market? Do you know of any in the UK that have the cup deposit scheme? 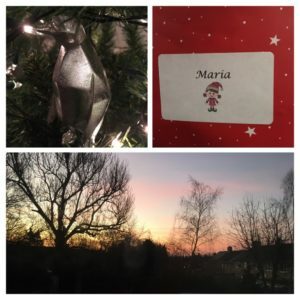 Author Maria RunsPosted on December 29, 2018 Categories General ramblings, Running, Stuff I love!, Travelling Tales6 Comments on Frohe Weihnachten! Originally last Saturday I was going to be heading into London to meet a couple of friends for a parkrun and breakfast, but one of them couldn’t make it so we have postponed until January. It probably turned out for the best because I hadn’t run all week and although I was feeling better, I opted for Panshanger which meant I could get up pretty late and drive around the corner, as opposed to getting up super early to run to the train station. I saw on their facebook page that they would be collecting old trainers and sports kit for Kit Aid, so I loaded up a bag with 3 pairs of trainers and some old race tops (is it just me that saves trainers?). It was absolutely freezing at parkrun, and I headed around fairly gently, with many a tissue stop! In the afternoon the rain started tipping down. We had tickets to see Reef in Oxford and were going to head to Waddesdon Manor on the way (an NT place) to see the Christmas lights, but we thought it would be pretty miserable wandering about in the rain, so we just headed into the centre of Oxford instead. A quick dinner in Leon and then a fun evening listening to them play the classics. 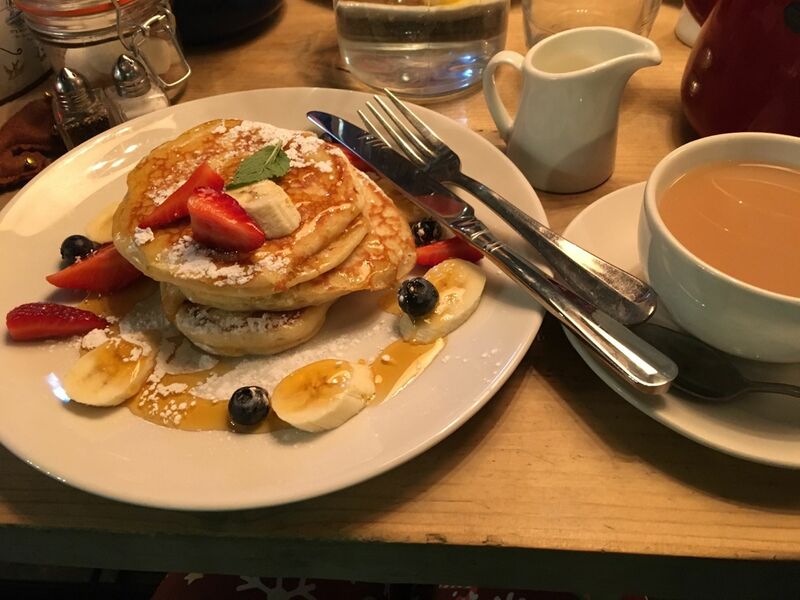 On Sunday morning it was time for the running club Christmas bRUNch- there is a club run (from Hatfield) and then we meet at Bill’s in WGC for brunch (some people just come from the breakfast without running too). It’s only a mile and a half from home, and as we had a pretty late night I only left at about 9am (the brunch was at 10). I thought I would meet them on the way but they ran a different way and it was rather slippery in places so I cut my run short, doing just over 4 miles in the end. Brunch was of course delicious, and it was lovely to catch up with people as I’ve not managed a club run in ages. Andy walked in and met me, and we walked home together. 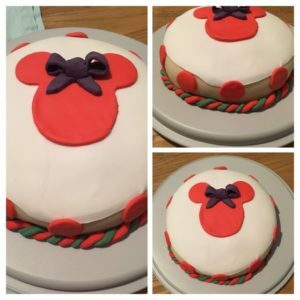 After a shower I did some cake decorating- I went for a Minnie Mouse theme for our cake this year to remind us of our Florida holiday. 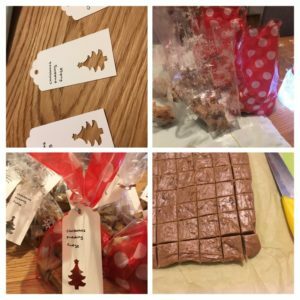 I also made another batch of the Christmas pudding fudge, bagged them all up and got gifts ready for people at work. 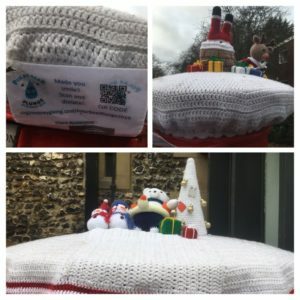 On Monday I popped into town after work to collect an order (I was meant to be having a massage but it was cancelled but I still needed to collect my order). I felt OK but then after dinner I felt a bit weird and went to bed feeling a bit under the weather. I think the germs at work were all catching up with me as occasionally I was feeling a bit dizzy and I was still getting over my cold. I had promised to come to the club run on Tuesday because it is moving to Wednesdays so I won’t be going any more, but it was cancelled at the last minute. The weather was pretty horrendous with sideways rain and winds, and I nearly didn’t go, but as I was already changed and needed to wash my hair I thought I’d just do a short one to get some (very) fresh air. I got absolutely soaked through- this running jacket isn’t waterproof (I really need to invest in a good one I think) and I got splashed by a van driving too close to the kerb. I did find a street that reminded me of Home Alone as every single house had really pretty white lights, although the photo didn’t really come out. I had to peel my clothes off they were so drenched when I got home! 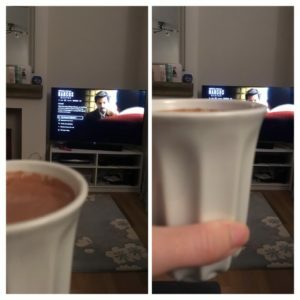 I had another short run on Wednesday, and in the evening we watched the final episode of Narcos and enjoyed a hot chocolate. 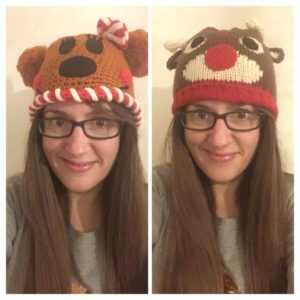 This week I’ve been cracking out my Christmas hats- I feel like I probably could wear the Minnie Mouse one at other times, but the Rudolph one really only has a short window to be worn in! On Thursday headed back into town for the massage. It was the most painful once since my first one I think- the amount of crunching coming from my shoulders was awful. I could move better afterwards, but I also have a few bruises on my back. The end of term stress is high! 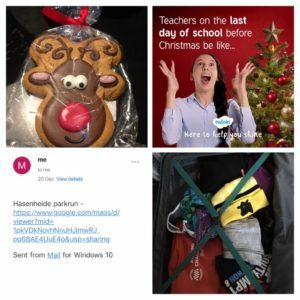 Once home I had to pack, as I was being picked up on Friday after school to go straight to Heathrow as we were going to Berlin for a few days over Christmas. Of course everyone checked that we weren’t flying from Gatwick, and we felt pretty lucky that we were away from that chaos. I’d emailed to myself the map of Hasenheide parkrun, looked up the directions on the train, packed my barcode wristband and cow hat- I was all ready. Literally 5 minutes after checking our bags, Andy got a text to say our flight had been cancelled. Argh! This then turned into a massive palaver because we then had to get our bags back. I had to join a queue, use a phone, give the receipts to a customer service person, then get my passport (one person per party was allowed to collect the bags so Andy waited outside looking at flight options on his phone) and be accompanied into the baggage hall. It then turned out I had to go through full on security (if you ever wondered where they send the people who aren’t cheerful enough to work on the customer security, the answer turns out to be behind the scenes for the staff and lost baggage security…). If I had known, I would have left my rucksack with Andy, so I had to take off my boots, empty my rucksack, get out my liquids, all the time being overtaken by members of staff (some of whom literally took trays out from under me as I was about to put my belongings into them). I said to the person scanning that I didn’t have a bag for my liquids as I hadn’t been through security because my flight was cancelled, and the lady said it was fine as long as I left them in the tray. However, once scanned the man (who was about 2m away from the woman) told me off for not having a bag, even though I had just explained that I didn’t have a bag and that the lady told me it was OK. He then stomped off to get me a bag, and then told me he now had to test the liquids . The lady who had accompanied the group of us had gone with everyone else and at this point I thought I was going to start crying- I find security stressful at the best of times and this was awful. I had to wait in the security bit for ages before eventually she came back, and when I explained that if I’d known I needed to go through security I would have left my bag and coat outside, she said “oh don’t worry, I’m not in a hurry”- argh! That wasn’t my point! In the baggage hall I had to join another queue at the customer service desk, to speak to the same lady again (I don’t understand the system at all)- she rang the baggage storage and our bags were released, so I had to wait by carousel 8. After waiting for half an hour and no sign of either bag, I went back to the desk but of course there was no one there. After 45 mins Andy’s bag came through, and then it was another 15 mins before my bag appeared and I could go out of the baggage hall and find Andy. The entire process was 2 hours! I was feeling so thirsty and tired and I just wanted to sit down. This was around 6.30pm and Andy’s parents were heading back from Southampton and said they would pick us up (my Dad had driven us) so we had a bit of time to get some dinner. I had a very tasty toasted sandwich from Caffe Nero (it was vegan cheese, sundried tomatoes and basil) and we shared the gingerbread that I’d been given at work. After getting the train to Terminal 3 (where they were picking us up) we got a cup of tea. We didn’t get home until about 10.30pm as we had to be dropped off at my parents’ (where Andy’s car was) and then drive home from there. This morning I went to Ellenbrook Fields for their festive parkrun- Dad and Tony cycled over and we ran around together. It was a gorgeous morning with blue skies- perfect for running. I went back to Mum and Dad’s for pancakes, so although not a Berlin parkrun, it was still a pretty good start to the weekend. After a shower we walked into town to pick up the free gift from John Lewis (a little gingerbread biscuit) and I booked a haircut (which is so lucky I popped in then as my hairdresser had one slot left this week and then she goes on holiday until some time in February!). 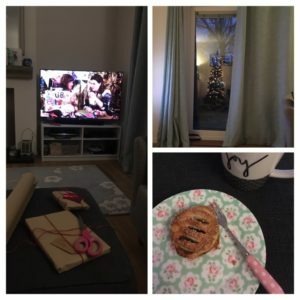 Then I chilled out in front of the TV, watching a load of things I’d recorded on the box including Liam Bakes, the Inside the Factory Christmas show and some Kirsty Homemade Christmas. I loved seeing the reflection of our Christmas tree in the door. I did a bit of present wrapping, and then in the afternoon made a pot of mince pie tea and warmed up a mince pie in the oven to enjoy. It may not be a German Christmas market but it’s still festive. We are booked on a flight tomorrow, so fingers crossed nothing will go wrong! 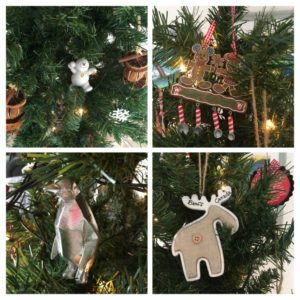 How has your Christmas countdown been? What are you planning for Christmas day? Last week turned into a bit of a rest week. 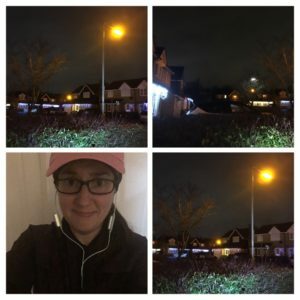 After having a bit of a sore throat on Sunday it turned into the lurgy on Monday- I am pretty impressed I got this far through the term without being ill. Monday is a rest day anyway and so we just had a little walk in the evening and that was enough. On Tuesday I had planned a run, but I felt pretty achy when I got home from work, so we walked around to the shop to pick up some throat sweets and ibuprofen (Andy also picked up some cold and flu medication and the lady on the check out ID’d me but I think it was because she felt sorry for me!). I was getting sore sinuses and although my throat didn’t really hurt, I was losing my voice coughing a bit, so admitting defeat and resting seemed like the best option. 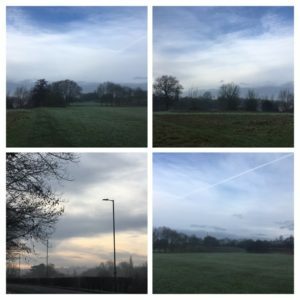 There was no yoga on Wednesday and I had again pencilled in a run, but when I got home all I wanted to do was lie on the sofa, and drink hot (fruit) tea with a little honey in it- I just had no energy for anything. Thankfully by Thursday I was feeling a little better. After work we had a team afternoon tea which was really lovely. 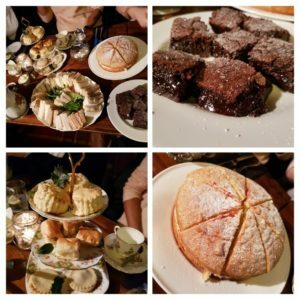 It was a vintage tea room inside a pub, and all the cakes were home-baked on the premises, including the most squidgy brownies and lovely warm mince pies with more mince than pastry (always a winner). We had to each take some cake home as no-one could manage a slice! We did a little secret Santa and I was given a lovely penguin decoration (I love penguins) and this went straight onto the tree as soon as I got home. Look how cute the label is! One of our team had made personalised labels for each person to stick on the presents so they stayed a secret. I did see some gorgeous sunrises this week as I was heading off to work- the pink hues are hard to capture but the sky looked pretty amazing. 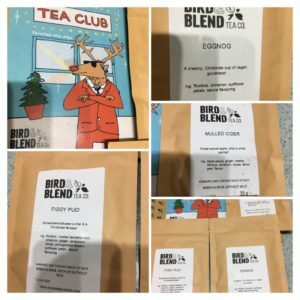 When I got home my tea club had arrived- more festive blends with Eggnog (rooibos and spices, no eggs thankfully), Figgy Pud (another spiced rooibos) and Mulled Cider which is the most gorgeous apple tea. (We were meant to be going to the cinema that evening too, but I think we have learned that we should not book tickets when I am somewhere else because I will always underestimate how long I will be! I think the last film we managed was Ralph Breaks the Internet. I am super excited about Mary Poppins though). On Friday after work I met my friend at The Waffle House. We walked up into town first to look at the St Albans Christmas market, which is still tiny, but not quite as tiny as last year. They had a few local stalls (like a glass blowing stall based in Sandridge) but I didn’t get anything- I am pretty much there with Christmas presents now so it was nice to wander and not feel the pressure of needing to find something. The outside of the restaurant was really pretty, with fairy lights everywhere and little reindeer lights by the water so the lights were reflecting- I felt very festive indeed. 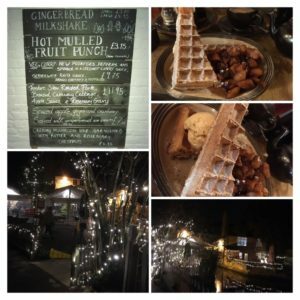 I fancied something wintery, and on the Specials menu was a waffle with apple, cranberry and ginger with gingerbread ice cream, so my decision was made! We sat inside by the fire and it was so cosy in there, and lovely to have a catch up as usual. When I got home Andy had put the fire on, and we watched Arietty, which is the Ghibli version of The Borrowers. As a side point I’ve been loving the podcast Ghiblioteque- they discuss a different Ghibli film each week (after watching it- they do have spoilers)- the Totoro episode made me so happy to listen to. We have not started on the Christmas movies yet though- I think not finishing until very close to Christmas means it doesn’t feel close enough yet, although we have been making the list of the classics- Home Alone, Muppets Christmas Carol, It’s a Wonderful Life, The Snowman and In Bruges so far, plus things like the Community Christmas episode from a few years back. What is on your Christmas film list? 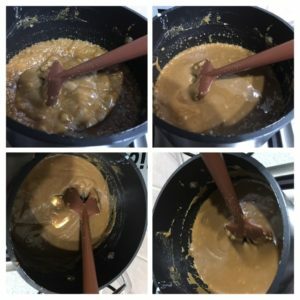 I have been making this fudge for years, but realised that the recipe on my blog needed a little update as I now use a stand mixer for the mixing at the end (instead of a hand whisk in the pan). It does sound a bit difficult, but I think the key is preparation (having everything ready before you start). 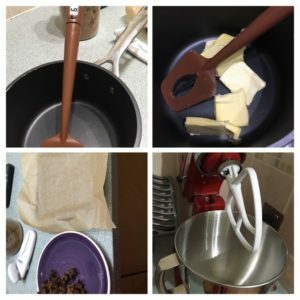 The recipe is a combination of one from The Pink Whisk website and one from a Rachel Allen cookbook. Preparation! I use my stand mixer so I put the attachment in and turn the plug on. Line a baking tray with baking paper, weigh out the ingredients and cut up the pudding and leave it on a plate (the pieces don’t need to be small because the mixer will mash them up). Put the butter, sugar and condensed milk in a pan and heat gently, stirring regularly. It will eventually bubble away and appear more smooth. The sugar thermometer needs to reach 235F. Once it reaches that, leave it for a few seconds before pouring it (carefully- it’s very hot) into the stand mixer. 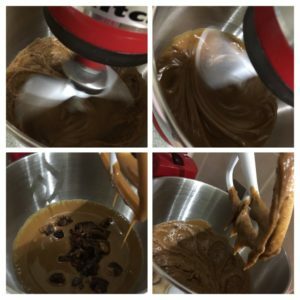 Turn on the mixer and whisk away. 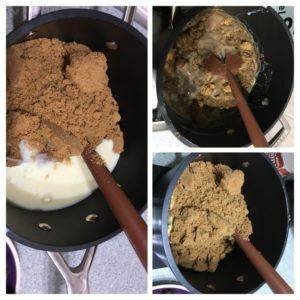 It takes a while, but eventually the mixture will thicken- if you stop the mixer and lift up the attachment it will leave ribbons in the mixture and drip slowly off. Add in the Christmas pudding and mix a little more until it is evenly dispersed. Pour into the lined pan and smooth the top- it won’t set too quickly so you have time to even it out. Leave it to cool for a few hours/ overnight, and then cut into lots of little squares ready to put into little bags. 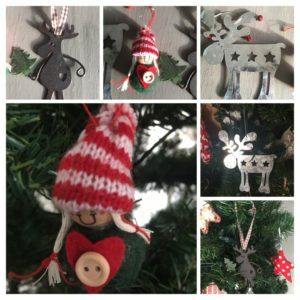 Do you like to make gifts? What is your favourite fudge flavour? I do like peanut butter and chocolate fudge, and I am tempted to do a different festive one with maybe cranberries and white chocolate chips. If you make it, let me know how it turns out!